Many wargamers have a fascination for the armoured fighting vehicle. The tank made its debut on the battlefield one hundred years ago, during the First World War. Since then, they have become the mainstay of most armies throughout the world. UWS member and artist David Pentland is well known in the hobby for his paintings, with illustrations of tanks being his speciality. Now he plans to publish a book tracing the history of this unique vehicle through his paintings and drawings. 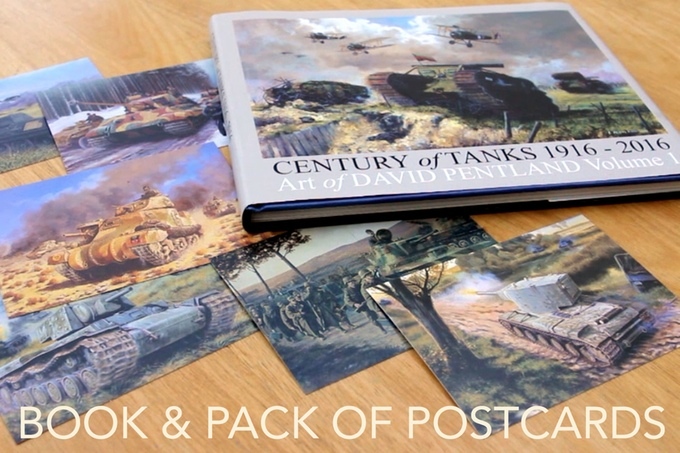 Like many hobby projects these days, Century of Tanks is being crowdfunded through the Kickstarter site (see here). If you're interested in the book, or even some prints and/or original paintings by David, you can pledge money to help fund the project. Your credit card will only be charged if the project reaches its funding target. At the time of writing, David's project has raised more than a third of its target in pledges. With more than three weeks to go, hopefully he will get there, and this unique book will be published.